Colour coded eating occurs when an individual makes his or her food choices based on the colour of a food. This is a type of disordered eating that can be detrimental to health if an individual can not obtain all needed nutrients from the foods that (s)he will eat. Overcoming eating by colour may require professional help if a disordered eater’s habits are strict enough to prohibit overcoming such eating patterns by his or herself. Eating by colour literally means that an individual will only eat foods of a certain colour, or will reject foods based solely on their colour. For example, a disordered eater may decide that (s)he will eat yellow foods, so yellow peppers are acceptable, but that (s)he may not eat orange foods, orange peppers are not. Similarly, a disordered eater may eat green foods, so broccoli and peas are acceptable, but not red foods, so red peppers and strawberries are not. Some disordered eaters may even eat all foods except for one colour. The defining characteristic of this eating habit, however, is to accept or reject foods based on colour rather than taste, texture, nutrition or any other variable. “Eating the rainbow” is a relatively new term that urges people to eat food of a variety of colours. This phrase became popular when it became known that foods of different colours contain different nutrients, so in order to have the most balanced diets foods of a variety of colours are needed. Unfortunately, individuals whose disordered eating is manifested in colour coded eating can not eat a rainbow of different foods. This means that such disordered eaters will automatically keep themselves from getting the most balanced diet possible. While taking vitamins or supplements may help to make up for missed nutrients, these items should not be taken without medical approval. Overcoming eating by colour may seem as easy as including more colourful foods in an individual’s diets, but if it were this easy to overcome many disordered eaters would not have fallen into their patterns in the first place. Instead, disordered eaters must recognise why they began to colour code their foods. Are there connotations with foods or colours? Did colour coding once serve a purpose? Did it begin as a method of dieting? Is there a measure of stress relief in this type of eating? By answering these questions and getting to the root of the colour coding, disordered eaters will be more likely to understand their habits and thus how to overcome them. However, some disordered eaters may find that they can not overcome eating by colour on their own. In this case the help of a dietician, nutritionist, counsellor or therapist may be invaluable to those trying to overcome colour coded eating. 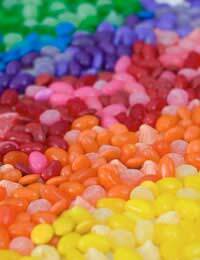 Colour coded eating is a type of disordered eating in which foods are accepted or rejected based on their colour. Overcoming this type of disordered eating will require an individual to investigate what purpose eating by colour serves and why (s)he turned to this habit in the first place.